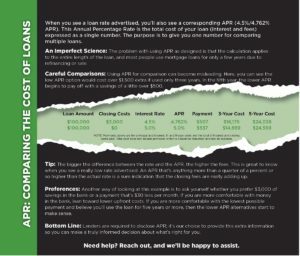 When you see a loan rate advertised, you’ll also see a corresponding APR (4.5%/4.762% APR). This Annual Percentage Rate is the total cost of your loan (interest and fees) expressed as a single number. The purpose is to give you one number for comparing multiple loans. An Imperfect Science: The problem with using APR as designed is that the calculation applies to the entire length of the loan, and most people use mortgage loans for only a few years due to refinancing or sale. 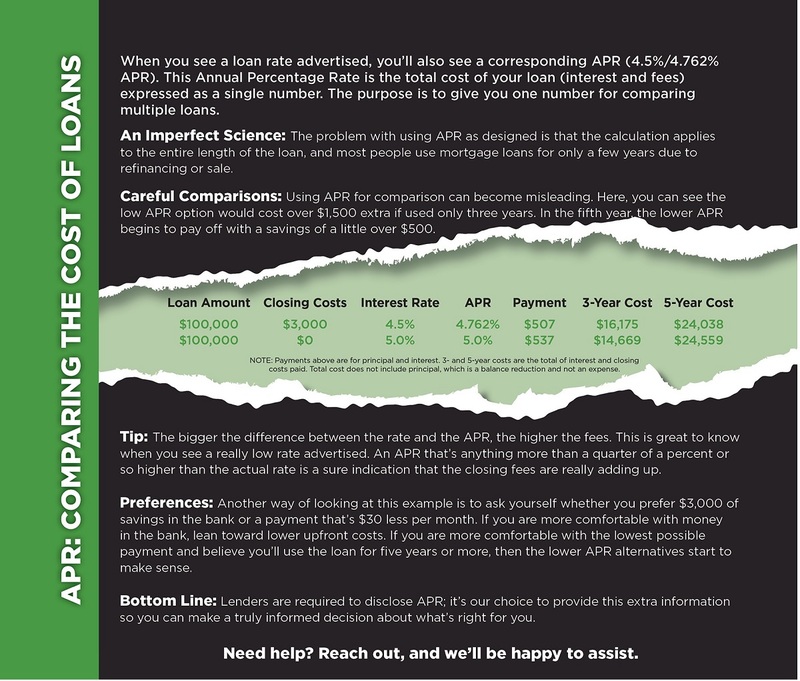 Careful Comparisons: Using APR for comparison can become misleading. Here, you can see the low APR option would cost over $1,500 extra if used only three years. In the fifth year, the lower APR begins to pay off with a savings of a little over $500. Tip: The bigger the difference between the rate and the APR, the higher the fees. This is great to know when you see a really low rate advertised. An APR that’s anything more than a quarter of a percent or so higher than the actual rate is a sure indication that the closing fees are really adding up. Preferences: Another way of looking at this example is to ask yourself whether you prefer $3,000 of savings in the bank or a payment that’s $30 less per month. If you are more comfortable with money in the bank, lean toward lower upfront costs. If you are more comfortable with the lowest possible payment and believe you’ll use the loan for five years or more, then the lower APR alternatives start to make sense. Bottom Line: Lenders are required to disclose APR; it’s our choice to provide this extra information so you can make a truly informed decision about what’s right for you. Need help? Reach out, and we’ll be happy to assist.